Spring is optimistic; an opportunity to reconnect with nature as trees return from dormancy, waters flow with vigor, and wildlife return to their warm weather habits. Some refer to this time as “mud season,” and hikers are urged to travel lightly and avoid sensitive places until the ground dry out. For recreational all-terrain vehicle (ATV) operators, this is also a time to prepare their machines for the year and start riding. Unfortunately, there are some who misuse their ATVs on our “Forever Wild” Forest Preserve and other state lands, with detrimental impacts. 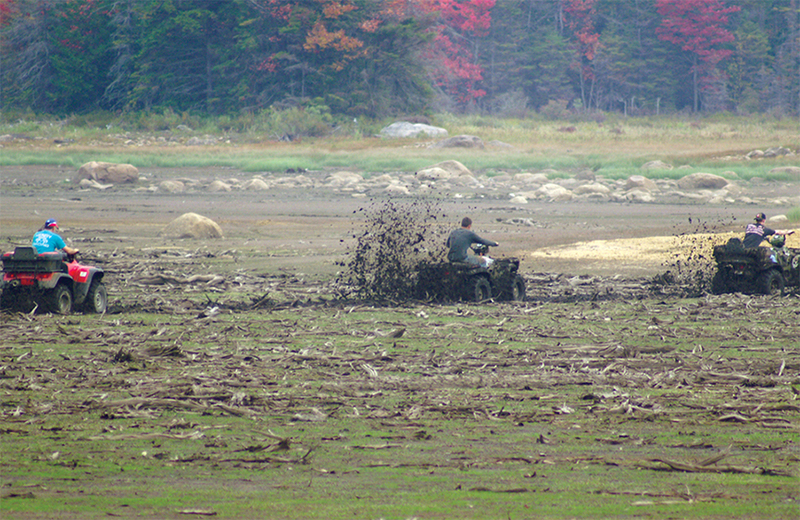 ATV misuse impacts our water, wildlife and wilderness in ways that are dissonant with nature. Vegetation is destroyed, soils are disturbed, and animals of all sizes are frightened away. But there is hope in Albany that we can do something to deter those who misuse their machines, and we and our coalition of partners are also optimistic. This spring, the legislature has an opportunity to protect the Forest Preserve and other state lands from ATV misuse - something we have needed for decades. If you would like to help, please click here send an email to the New York State Senate and Assembly Environmental Conservation Chairs and ask them to protect our Forest Preserve from ATV misuse, and enact strict penalties for violators. This is all explained in a report the Adirondack Council released this week entitled WRONG WAY: How New York State Can Course-Correct on ATV Use. The report points out that, in recent years, state officials have moved in the wrong direction, and have loosened restrictions on ATV use. They have proposed recreational ATV routes that increase the likelihood of trespass on public lands that are off-limits. In contrast to actions that promote ATV misuse, there has been a flood of new visitation to the Park’s scenic Forest Preserve due to Gov. Andrew Cuomo’s investments in tourism. More people visiting the Adirondacks is a good thing, but more ATV violations on the Forest Preserve clearly is not. Without strong penalties and better ATV management, increased erosion and water pollution and threats to people’s safety may be unwelcome consequences. In addition, the state’s current policies that are supposed to protect public lands from ATV misuse are weak and often ignored. Over the last decade, our state Forest Rangers have issued an average of 496 tickets per year for misuse of ATVs, the majority of which are for violations in and adjacent to the Adirondack Park. What’s worse is that the tickets for trespassing on public lands are frequently dismissed or result in no penalties. These are empty punishments that don’t deter repeat offenses. What we need is a law that makes it clear that ATVs are not allowed on public lands, has effective punishments for violators, and protects our forests, waters, wildlife, and public health. The legislature needs to act now to help stop ATV misuse. Forest Rangers are on the frontlines working hard to protect our public safety and natural resources on the Forest Preserve and other state lands. They have called the misuse of ATVs the most problematic enforcement issue they face, and have repeatedly warned state officials that ATV use is harming public resources. ATVs are dangerous machines, and ATV manufacturers warn users not to operate ATVs on roads or if under the age of 16. However, New York law currently allows local governments to open public roads to ATVs, and allows kids as young as 10 to operate an ATV by themselves. This is a frightening combination, which allows 10 year olds to drive ATVs on roads with cars and trucks. Too often, the results are tragic. In 2016, ATV crashes sent 101,200 Americans to emergency rooms. Of those, nearly 27,000 were children under 16 years old. ATVs have a place in the Adirondacks. They are useful tools on private lands such as farms, construction sites and logging operations. However, care must be taken to prevent trespass onto public and private lands where their use is unauthorized. As recreational vehicles, ATVs are a menace to public resources, and require careful planning and management. ATVs don’t belong on the Forest Preserve, unless used for search and rescue, for actions relating to the management of the natural resources, or in providing access for people with disabilities. The Adirondack Council will continue to work with other stakeholders to convince the state legislature to pass legislation that will keep ATVs off the Adirondack Forest Preserve and other fragile state lands to protect lands, waters, wildlife, and public safety. We will also push for increased penalties for violators to deter repeat offenders.